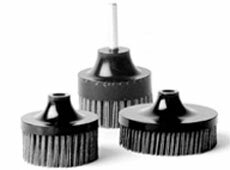 Brush Research Manufacturing produces Hex-Drive abrasive brush tools for applications including deburring, edge radiusing and general surface finishing and cleaning. Included in our line of industrial brushes, the Hex-Drive brush tool can be easily manipulated and turned for complete surface finishing. If you'd like to know more about how this tool and other abrasive industrial brushes can work in your application, contact a distributor today. These abrasive brush tools are designed for use in semi-automatic and fully automatic machinery, including NC, CNC and robotic machine tools. The unique Hex-Drive™ system allows the tools to be turned in both directions for 360 finishing. Typical applications for this industrial brush tool include deburring, edge radiusing and general surface finishing.